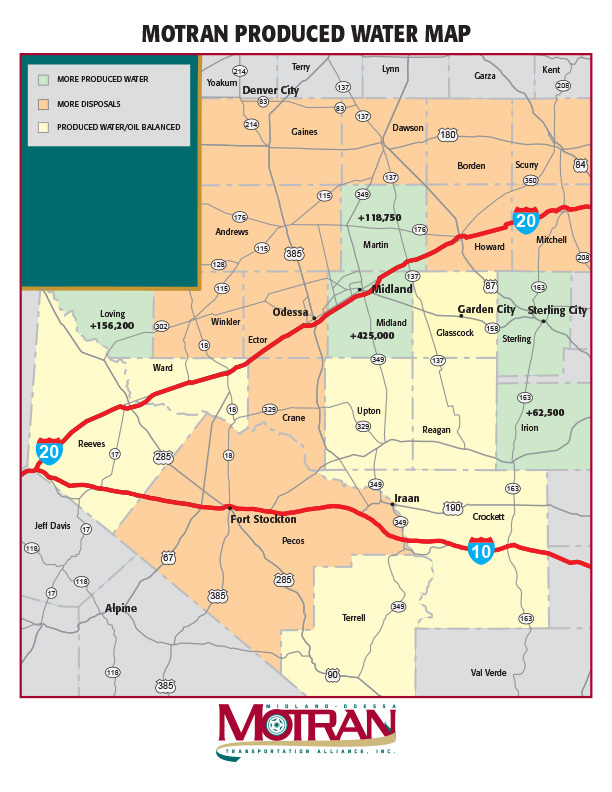 During the development of the Texas Freight Plan, MOTRAN officials noted a lack of focus on freight in the Permian Basin. Over the last year, through research and data collection, it was discovered that much of the data used in the development of the state freight plan does not incorporate the high degree of regionally generated freight that we see in the energy sector and Permian Basin. MOTRAN began looking for ways to document local and regionally generated freight. While much of the energy sector funding has historically been directed towards short-term drilling activity, MOTRAN has always encouraged looking at the long-term transportation impacts of actual production. While so much of the emphasis on energy sector activity focuses on what it takes to produce a barrel of oil, long-time Permian insiders understand that the real impact to roads and highways is the disposal of produced/brine water that goes with it. In fact, for every barrel of oil produced, there are generally three to five barrels of produced water, and the bulk of that produced water is disposed of by trucks that move this freight from battery locations to disposal wells throughout the Permian Basin. With the generous assistance of Railroad Commission Chairman Christi Craddick, MOTRAN worked to break down documented volumes of disposed water, converting that volume to truck trips, and daily truck miles. The conservative methodology produced astonishing results. When comparing the daily truck miles TXDOT estimates on roads and highways with the miles needed to dispose of produced water, we found a deficit of nearly half a billion miles. In other words, our area sees more truck miles from the disposal of brine water, not including any other freight activity, than TXDOT has estimated in total. Since these miles are a major factor in state funding formulas, the impact is tremendous. 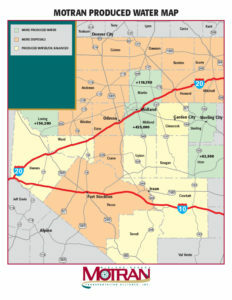 “We are grateful for the opportunity these freight hearings have provided us to learn more about how TXDOT views freight in the state and to find well-documented data to make the case that this model needs to include factors to add regionally generated freight,” said MOTRAN President James Beauchamp.